The Taoiseach Enda Kenny has indicated he will not announce any retirement plans until political uncertainty in Northern Ireland is addressed and the EU's negotiating stance on Brexit is agreed. Mr Kenny said those "immediate priorities" would take precedence over "everything else" on his return to Ireland tomorrow after a week-long trip to the US. 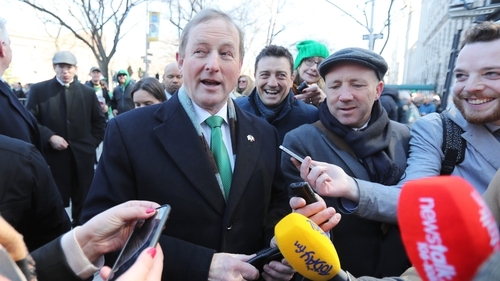 Prior to leaving for his annual St Patrick's programme of engagements in the US, the Taoiseach told members of his Fine Gael party he would address his future "effectively and conclusively" upon his return. He had been under pressure to set a timetable for his departure. After taking part in the St Patrick's Day parade in New York, he made clear that dealing with his own future would take a back seat to pressing concerns at Stormont and within the European Union. "What I did say to my own party was I would deal with this matter effectively and conclusively, and that is my intention, but I think these are priorities that take precedence over everything else," he said. "You can't have a situation where you have no leadership in Northern Ireland and where we have to define from a European Union point of view where Ireland would be, what the agreed terms of reference for the (Brexit) negotiations are." Parties in Northern Ireland have until the end of the month to strike a deal to restore power-sharing after a snap election triggered by a bitter fall-out between erstwhile partners-in-government, Sinn Féin and the Democratic Unionists. If an agreement fails to materialise before the deadline, political uncertainty in the North will intensify, with the prospect of another snap poll or a return to direct rule from Westminster. The coming weeks will also see British Prime Minister Theresa May trigger Article 50 of the Lisbon Treaty to formally commence the UK's departure from the EU - a move that is set to have major ramifications on both sides of the Irish border. Mr Kenny told Irish media in New York: "Do you not think it is appropriate that the immediate priority here is to have an executive functioning here in Northern Ireland? "Do you not think it appropriate that, after all the work we have put together, that we get an agreed negotiating stance for the European Union? "It's going to affect everybody in our country - these are two immediate priorities." Mr Kenny said his trip to the US had been a success. The Taoiseach met US President Donald Trump, Vice President Mike Pence and Speaker Paul Ryan in Washington yesterday, discussing issues such as Brexit, Northern Ireland and the 50,000 "undocumented" Irish who live in the US without legal permission. Meanwhile, Mr Kenny has said both he and UK Prime Minister Theresa May are in agreement that there will be no return to direct rule in Northern Ireland. Addressing a business event in New York, Mr Kenny urged the parties at Stormont to focus on forming a new power-sharing executive. Mr Kenny's remarks at Bloomberg's offices in New York suggested that Mrs May has ruled out direct rule from Westminster. "I hope that the elected members of the Assembly will now focus through their parties on actually putting an executive in place within the three weeks from the date of the election," he said. "If that doesn't happen the Secretary of State for Northern Ireland (James Brokenshire) would then either have to hold further elections or have direct rule again from Britain. "I have spoken very clearly to the British Prime Minister and we are both agreed that there will be no return to direct rule from London. "So I do hope that the executive can be put in place, because this has implications for the peace process." The Taoiseach also insisted that Ireland will not be following the UK out of the European Union. He was more confident about the EU's future in the wake of the centre ground victory in the Dutch election. Mr Kenny said that the "cornerstone" of much of Ireland's social progress in the last generation was due to the EU. "To continue to succeed as an open economy and welcoming society, we must and we will remain at the very heart of Europe," he said. In terms of Brexit, he said: "It is not a trigger for Ireland to follow suit and leave the European Union with the United Kingdom - we will not do so." Asked if he was more confident about the EU after the Dutch result, he said: "I am.